This recipe uses whole grain oat flour. You can use gluten-free oat flour if needed. Even if you don't eat whole grains or have severely reduced the frequency of eating them this recipe can be extremely helpful at times. I like this recipe is for two important reasons. #1 Mainly because oat flour is so much cheaper than gluten-free and grain-free almond flour or coconut flour. #2 Oat flour resembles traditional wheat flour so much that people find it hard to believe these Chocolate Chip Cookies are Wholetarian (made with whole foods). Since Chocolate Chip Cookies are likely the most loved cookies of all time you know the need to make them is going to arise sooner or later. Whether it is for yourself during your own transitional period, for that rare treat or for when you are asked to bring cookies for a party and your integrity really wants to keep it healthy. For a variety of reasons, you'll be glad you have this recipe. Note: Whole sugars vary in sweetness so you may have to make adjustments to this recipe depending on the type of whole granulated sugar you use as well as the level of sweetness you prefer. Just taste the batter and add more sweetener if needed. 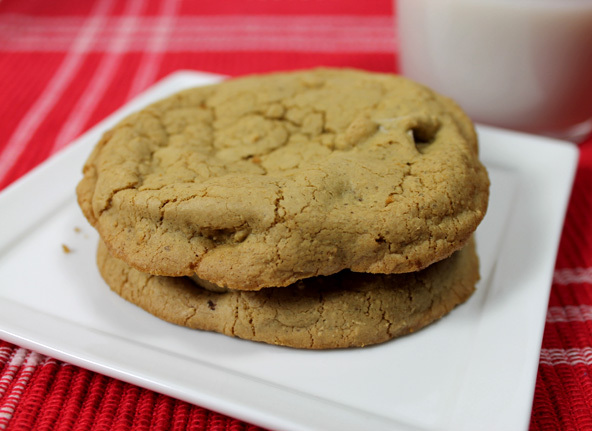 ½ cup grass-fed butter OR coconut oil (or a mixture of both) For best tasting cookies use Kerrygold Pure Irish butter. Grease 2 large baking sheets with coconut oil. In a medium mixing bowl, add the grass-fed butter or coconut oil or mixture of both, add eggs, unrefined sugar and vanilla. Blend together well with a hand mixer. Add the oat flour. I purchase oat groats and grind them up in a kitchen flour mill because its cheaper and freshest that way. I use a Whole Grain Flour Mill by Kitchen Specialties. If you don't have a mill you can use a coffee grinder (not one used for coffee) only it will be more coarse. You can grind up oat groats or old fashioned oats in a high powered blender to turn it into a flour. Add the salt and baking soda and blend together. Taste the batter and blend in a little more whole sugar if needed. Hand stir in the chocolate chips. Use a 1¼" ice cream scooper and place dough on the prepared baking sheets, allowing 3-4" between cookies. Let the cookies cool on the baking sheets.